Finally. After all these years of being an artist, finally, I was able to draw what animates me to draw, what inspires me, what makes me go on, no matter what. 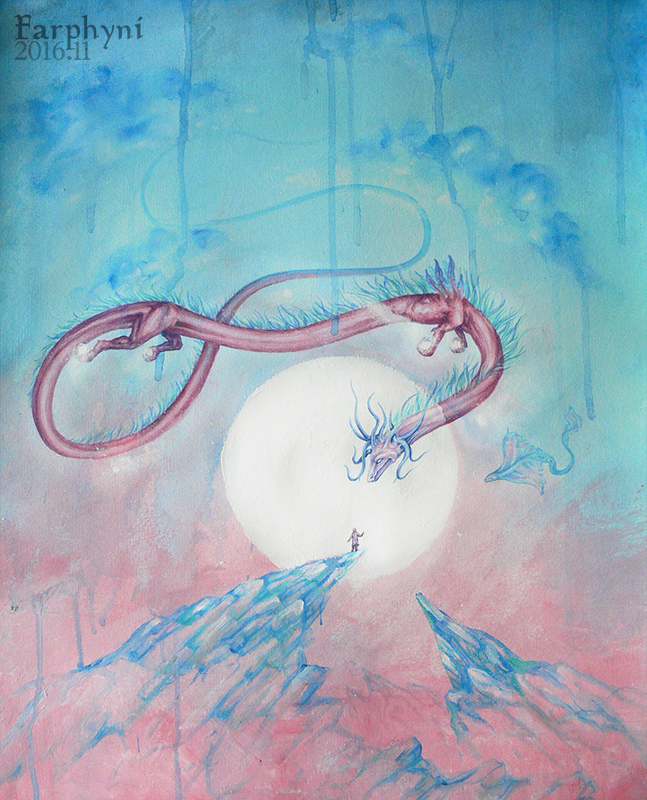 Actually it is extremely simple, just like this artwork, but very hard to describe/catch, just like the spirit dragon. The songs are always there, burn inside me. I don’t know where they come from, from which depths they arise, from which heights they fall. I only know, that they devour me, when I capture them and not release them. And if you let them free, let them evolve and realize them, they can take you away to places that look like melting dreamscapes, as reality is always present, but not clear defined. A truly wonderful place for a symbolist like me. This “song”-stuff may sound confusing – another reason why I never really tried to describe it, I’m much better with drawing than with describing something with only words. Our language is way too limited. It was great to draw this work. I didn’t sketch it, just started straight ahead, no concepts, no outlines. Just the song, me and an empty white piece of paper (and of course all my art tools~). And I drew in a way, where one mistake can ruin the whole work and there is barely any chance to correct it. But the song, that came with the artwork and accompanied the whole process, took me away to a place where something like “mistake” doesn’t exist. And even though the work is not perfect, it is exactly the way it should be – according to the song. See the artworks, catch a glimpse of their song.